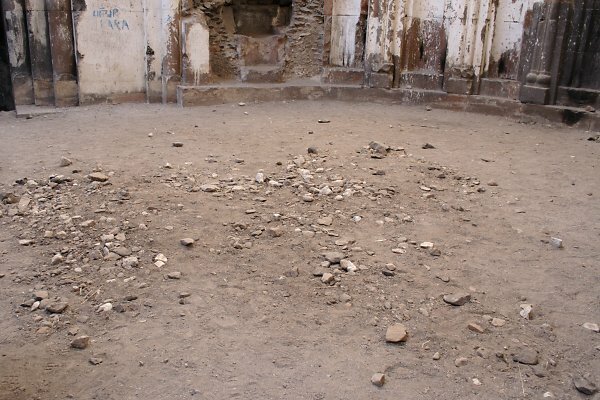 Armenian Architecture - VirtualANI - Damage to Ani between 2006 and 2007. 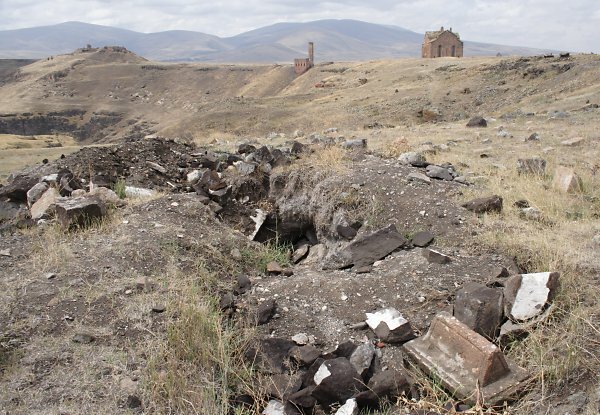 During the 1980s and 1990s, when the whole site of Ani was under the full control of the Turkish Army, very little damage was done to the remains as a result of the activities of treasure hunters. This was in marked contrast to most other archaeological sites in Turkey. Part of the conditions set by the Turkish army before allowing this hand-over was that civilian guards had to be appointed to supervise the site and replace the duties previously performed by the soldiers. These guards are not actually employees of the Ministry of Culture because the task of guarding Ani was subcontracted to a Kars-based business. All the guards are inhabitants of Ocakli village, located just outside Ani's walls. At night they use their position of authority to roam the ruins at will, digging anywhere they think may contain treasure. The following photographs document some of the damage they have done. All of this destruction took place between August 2006 and August 2007. It is probable that considerably more damage has been done to the remains than is depicted here. In many cases the evidence is located in the less-visited parts of Ani and would be only noticeable when actually walked over. 1. and 2. In 2002 and 2003, French archaeologists from the Sorbonne excavated a series of structures located beside the west façade of the cathedral. A row of three chambers was uncovered. At the southern end of the row is a chamber open to the south. 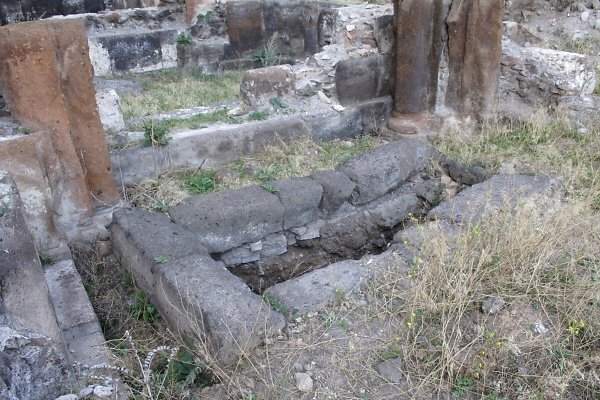 Inside it is a grave that may have been that of Queen Katranide who had the cathedral completed. The archaeologists excavated the contents of the grave, but no human remains were found. Treasure hunters have now dug out the entire contents of the grave. 3. 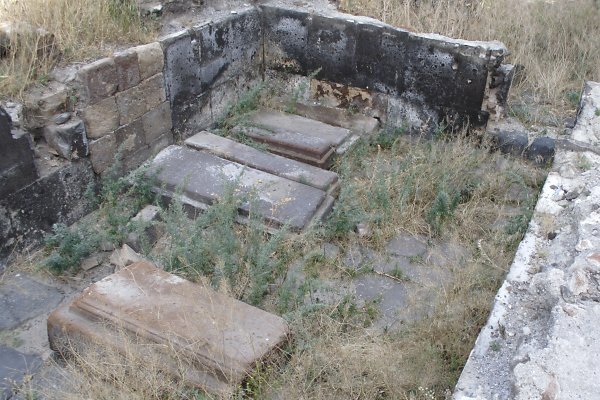 To the north of the Katranide tomb is a small chapel, then there is a rectangular chamber that contains a row of six gravestones, two of which have inscriptions on them. Because of the significance of the location, in the shadow of the cathedral, it is probable that only Ani's most important personages would have been interred there. The above photograph shows the chamber in 2006. 4. The above photograph shows the same view in 2007. 5. 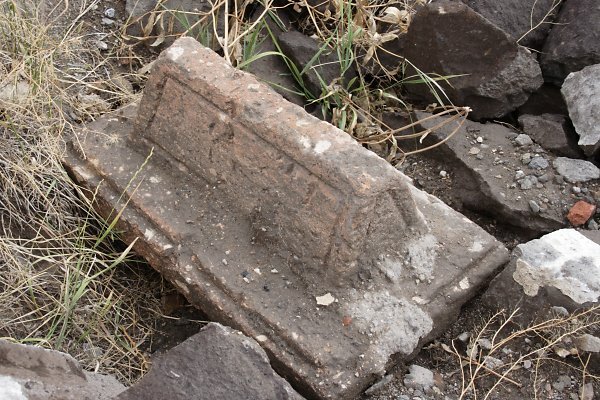 The broken gravestone and the upturned gravestone were the two stones that had inscriptions in Armenian on them. 6. 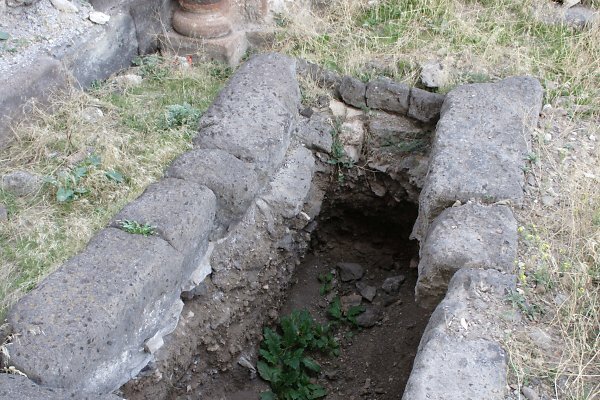 On the floor of the apse of the cathedral, an area of disturbed ground indicates the spot where the Ani guards had dug a large hole in their quest for treasure. 7. and 8. 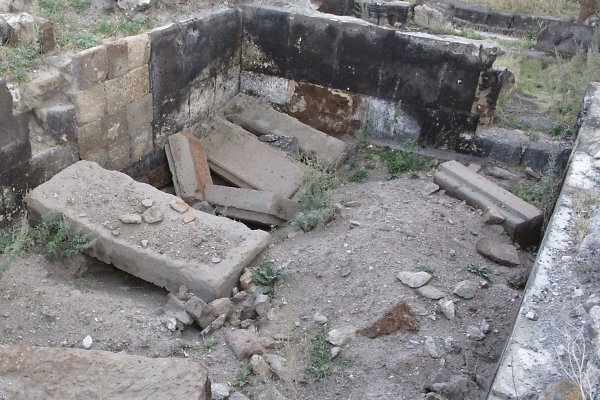 The photographs above show a series of sarcophagus-like structures, almost certainly graves, located near the Church of St. Gregory of the Abughamirs. Between 2006 and 2007 their contents were dug out, then roughly filled in again. 9. This photograph was taken inside the Church of Tigran Honents. 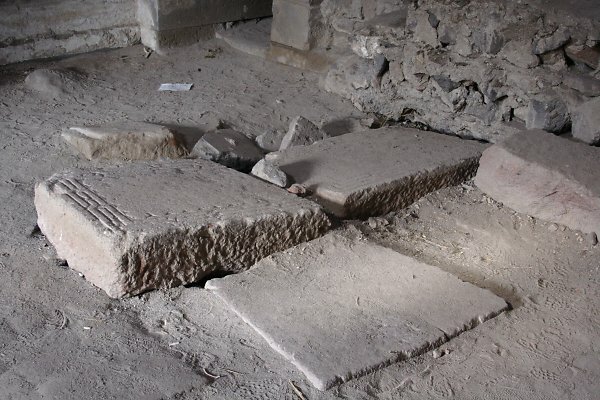 Several large gravestones set into the floor in front of the apse have been moved and the ground beneath them has been dug up. 10. Inside the north-west corner of the Tigran Honents church. 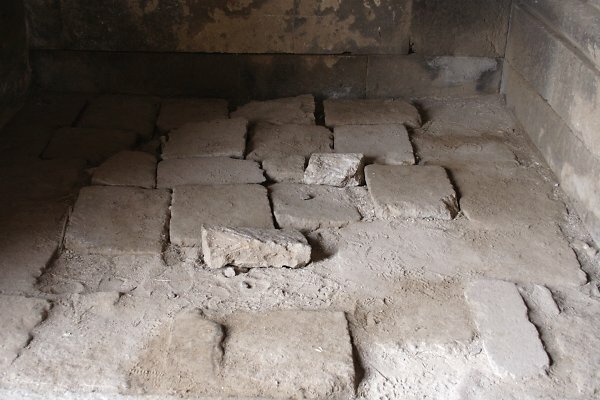 The medieval floor paving has been pulled up to allow the digging of a hole, and has then been roughly re-laid. 11. This part of Ani is located to the east of the cathedral and overlooks the Tigran Honents church. It contains the site of a medieval cemetery. 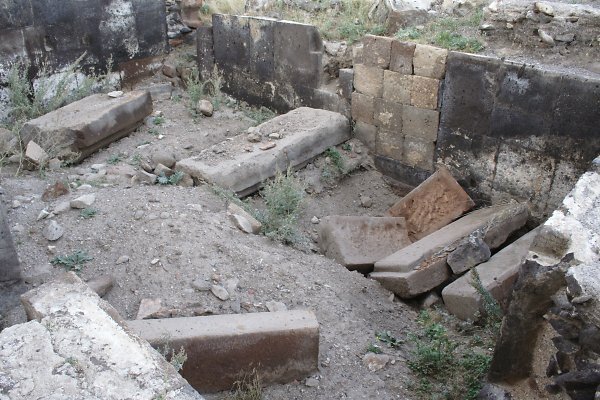 Several of the graves have been dug up, and gravestones and capping slabs have been broken. 12. and 13. 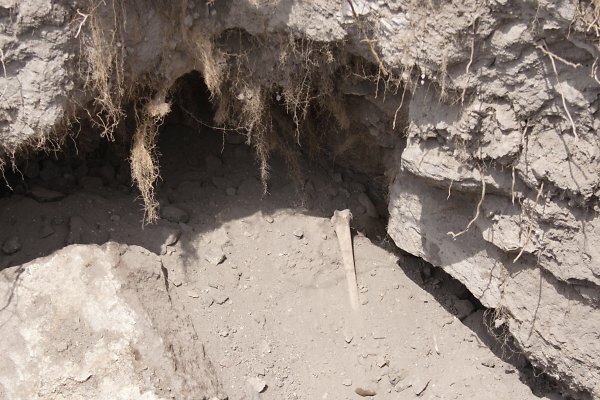 Human bones are visible inside one of the desecrated graves. This page [destruction at Ani, 2006-2007] was first published on the 8th October 2007 and was last revised on the 8th October 2007.